Spurs fan and keen sporting historian PHILIP BARKER revels in more than a century of history-making at White Hart Lane. Back in May, there was scarcely a dry eye when, as if ordained, a rainbow appeared over North London after the last match played at White Hart Lane, before the old ground was demolished. That rainbow provides a striking endpaper for SJA member Mike Donovan’s “Glory Glory Lane”. Produced in conjunction with The Times, his book covers 118 years of the ground in a style befitting a team for which finesse and artistry were often bywords. True, there is an emphasis on the modern era. Almost half the book details the 43 years since the departure of the club’s most illustrious manager Bill Nicholson. The story is not just football, there are illustrations and reports from some of the more unusual events, including a short-lived dalliance with American Football’s London Monarchs and the ill-fated Chris Eubank/ Michael Watson fight in 1991. The social history is well documented too, with a reminder of the riots in the 1980s and more recently. There are chapters on negotiations leading to the deal to rebuild the ground and what it will look like next summer. That’s all done with those ‘artist’s impressions’ so beloved of newspaper editors. The illustrations have been well chosen. Much of the match action has a fresh feel while there are informal training shots and even some images I hadn’t seen before of the victory parades down the Tottenham High Road. “White Hart Lane was one the greatest places to play football. It was like the gladiators entering the Colosseum,” said Alan Mullery in his foreword. He lifted the UEFA Cup on the ground in 1972. How appropriate that the capacity of the new ground will be 61,000 in tribute to those legendary players. It is by no means the only book to appear about this famous old stadium, nor is it the first ground title by the publishers Pitch. They did something very similar to commemorate West Ham’s Upton Park a couple of years ago. Curiously it was an Arsenal fan, Simon Inglis, who more or less launched the genre with his “Football Grounds of England and Wales” back in the 1980s. The target audience for this volume is of course the other side of that great rivalry. 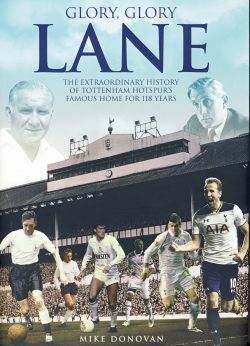 I declare an interest which can be traced back to a first match at White Hart Lane in 1969, but this is a book which will delight anyone with an interest in football history. Why there’s even a brief mention of Monday May 3 1971 when the League title was clinched at the ground by Arsenal!